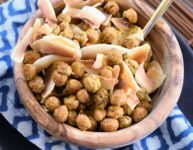 Roasted Curry Coconut Garbanzo Beans | Recipe For A Party | Life is a Party, So Celebrate! 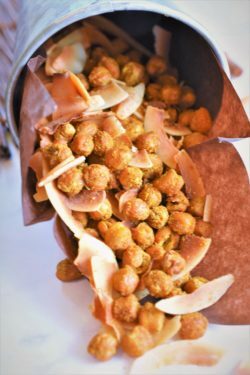 If you are like me, when you are on a diet or trying to watch what you eat, all of a sudden you can’t stop thinking about crunching on chips, nuts or anything that is crispy. 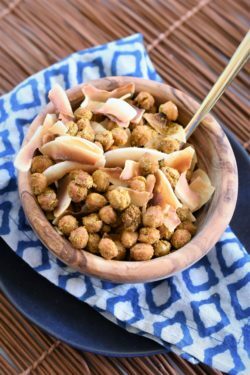 Well, I have the answer to keeping your cravings satisfied with these spiced oven roasted crunchy garbanzo beans. They are full of protein, low fat and low calories and full of fiber. 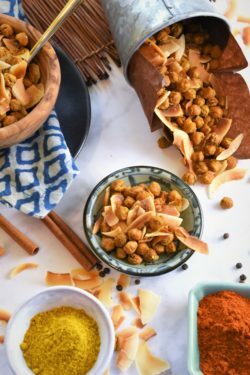 Try sprinkling them on salads or soups instead of using croutons and crunch and munch away on these little curried gems from heaven. 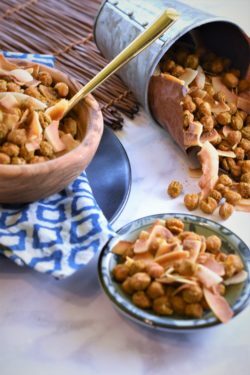 Serve them at cocktails parties so your party guests have a healthy alternative, especially your party guests that have nut allergies. Give a jar to the hostess and demand she opens it up and serve them right away. 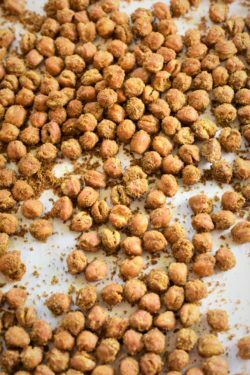 A great snacking alternative to nuts and they top the flavor scale! Rinse, drain and dry garbanzo beans really well, I laid mine down on a sheet pan with paper towels on the bottom and top and let rest for 30 minutes, patting dry every now and then. Add beans to a mixing bowl and coat them evenly with the melted coconut oil and mix spices in a separate small bowl and then add to the beans and mix well. Pour the beans onto a parchment lined sheet pan and place in preheated oven until browned and crunchy, stirring every 10 minutes so they don’t burn, they should be done from 35 to 45 minutes. Test them; they should be crunchy right out of the oven….mine took 50 minutes on convection mode. While the beans are cooling, place the coconut on a parchment lined sheet pan and bake for 8 to 10 minutes, stirring halfway through until golden brown. Turkey apple burgers are fabulous!! Thanks for sharing.